I cook a roast (we prefer pork but use the meat of your preference), debone and pick off the fat then put the shredded meat into another stew pot and set aside. If you can't find the ingredients at your local grocery store, a Mexican store will carry them all. 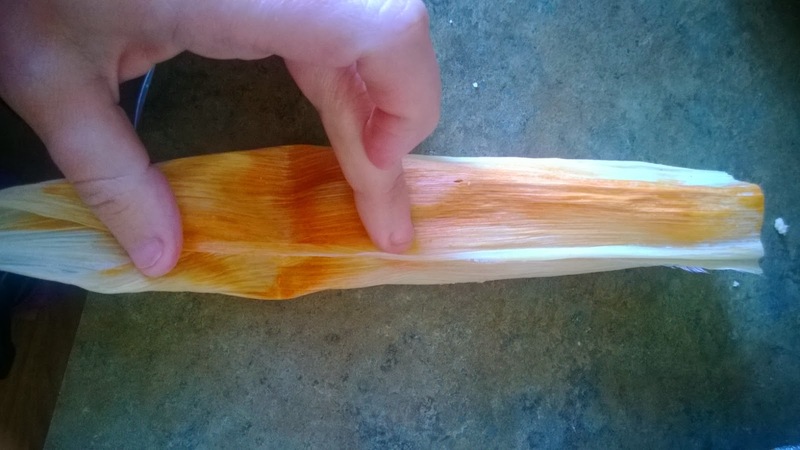 Corn husks - start soaking in water for about 20 min and then drain. I soak them while I'm preparing the rest of the ingredients. Take about 10 red chile pods (more if you're using a roast bigger than 5lbs) and boil them in water until soft - about 15/20 minutes. When they're soft I pluck off the stem and put the entire pod into the blender, I also add some of the water they were boiled in to make it more sauce like, rather than paste. 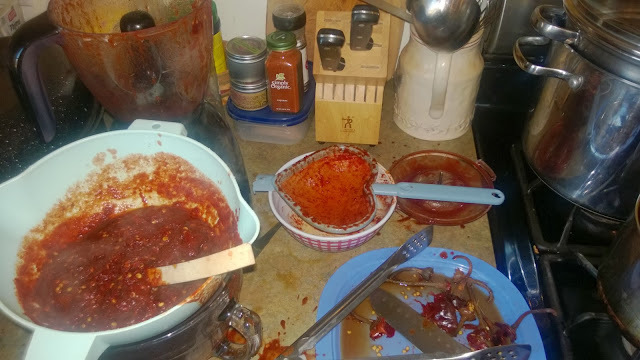 After the pods are pureed, I put them through a strainer to catch the skins and seeds while the sauce runs into a container. I like to add a few seeds then to the finished chile sauce but this is preference - I think it adds a little extra heat and the hubby likes it hot. 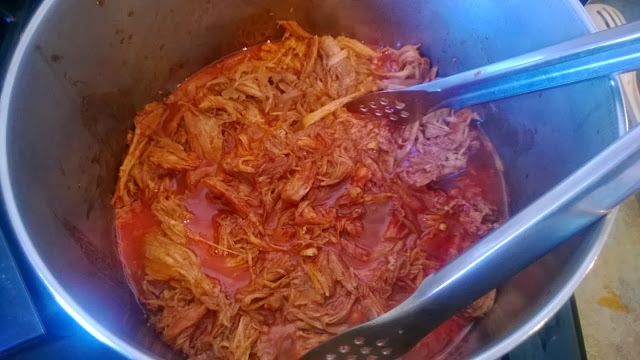 if you make a HUGE mess making the red chile sauce...you're not alone, so do I.
I then add the chile sauce to my stew pot of meat and simmer until the meat is softly shredded and the chile sauce has cooked down. 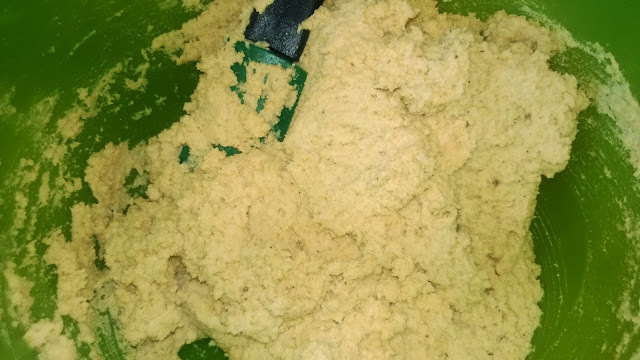 I use Tamal corn masa mix for the masa. I follow the instructions on the bag - using lard instead of margarine and broth from the meat I cooked, instead of water. The masa will need to be very spreadable, so you may need to add more broth or water if needed to get a soft consistency. 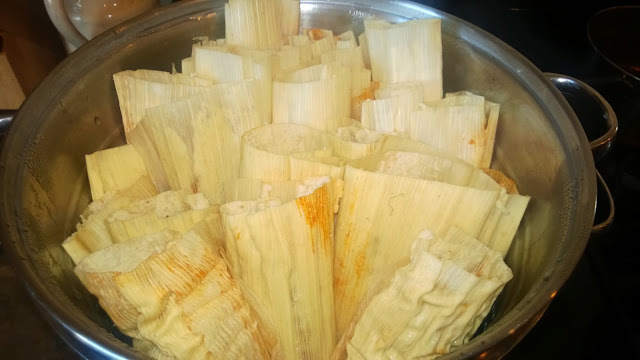 Now you're ready to make the tamales - get your corn husks out of the water and I pat dry a bit so the masa can be spread a little easier. Lay the corn husk out flat and spread about 3/4 of the corn husk with masa - I like a thin layer of masa but make sure you get the husk covered (think spreading peanut butter on a piece of bread). 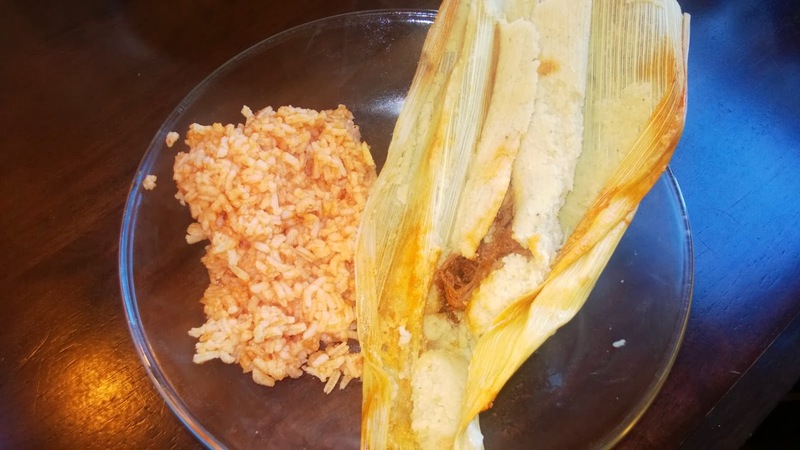 The thicker the masa, the thicker the tamale. Which means you may run out of folding room depending on the size of the corn husk. You will also run out of masa FAST. So I prefer thin. Once you have your masa spread - add a chunk of your chile meat to the middle of your masa. The idea is to have the masa completely cover the meat once it's folded. We like a lot of meat so I'm generous with it as long as it fits in the middle of the masa..I fill it up. Keeping in mind that masa needs to be on all sides of the meat, now you fold. Repeat until all your meat or masa or corn husks are gone. 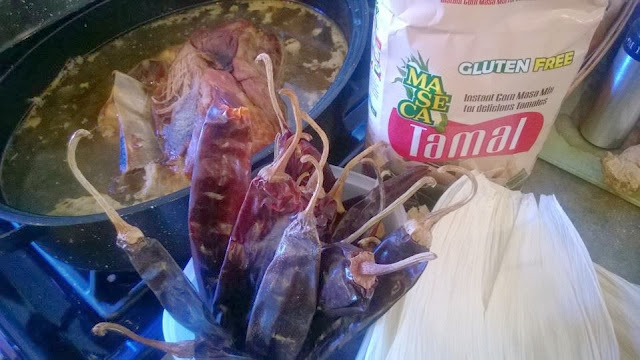 Since my steam pot is on the small side, I usually make just a couple dozen tamales at a time. But I prefer to make dozens and dozens at a time and then freeze the extras (after they're steamed). They're just as tasty reheated! You will need a steam pot of some sort - I just use the one I can with. Steam for about an hour until the masa is firm. The more masa in your corn husk the longer it takes to cook. After they're done, peel the corn husk off and eat. 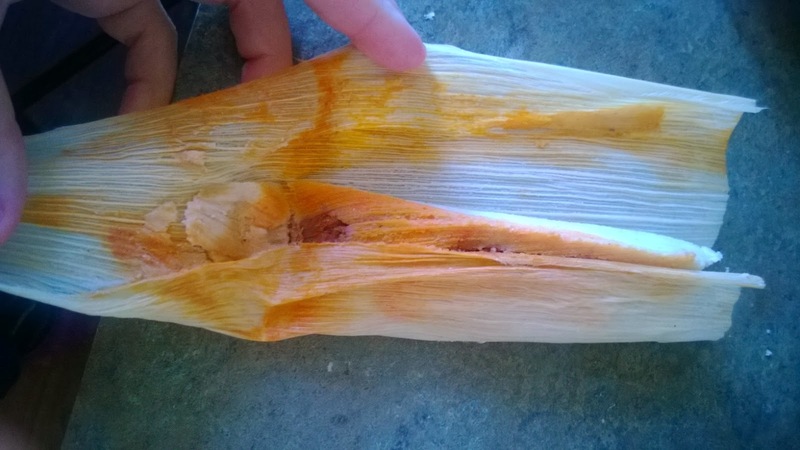 Once you get a taste for tamales, you will always crave them. At least that's my story. PS. If after you've filled all the corn husks you wanna fill and still have red chile meat left over - roll some up in a tortilla. It is AMAZING. Thank you so much for the detailed description, I always wanted to learn to make tamales. I have a tortilla press and have learned to make them. I bet you do the same. A word to the wise, if the kitchen doesn't get messing from the preparations then your not doing it right. 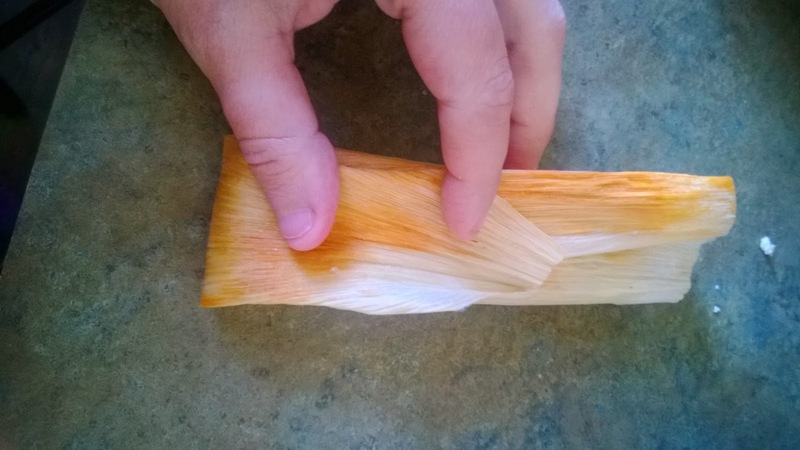 What a great tutorial on making tamales. I am always looking for a new recipe and was excited to see this. I can't wait to try them. Thank you for sharing with the Clever Chicks Blog Hop! I hope you’ll join us again next week! 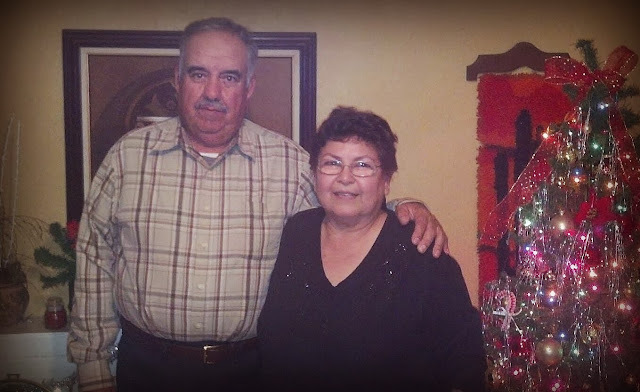 thank you for the feedback Kathy, I'm honored you stopped by my blog!